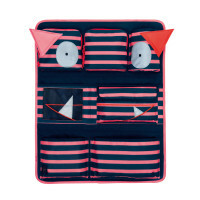 Product information "Car Wrap-to-Go Little Monsters - Mad Mabel"
description & equipment Travel safely in the car: The Car Wrap-to-Go with multicolored stripes from the Little Monsters collection is the favorite travel toy that's always within reach. 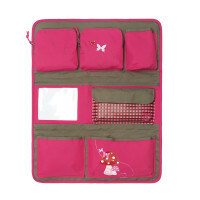 The wide eyes and funny face also make it a friendly travel companion. 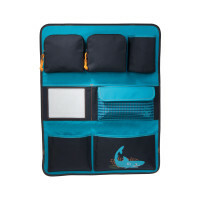 This convenient seat organizer can be easily attached to the back of the driver's or front passenger's set. 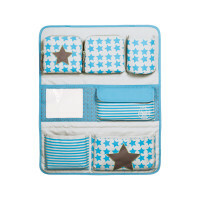 Several Velcro and zip pockets and compartments provide plenty of storage space for playthings, plush animals, snacks and beverages. 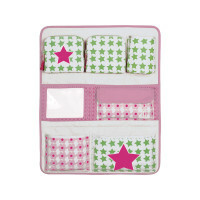 Chaos on the backseat is a thing of the past and all essential items are now always within reach.